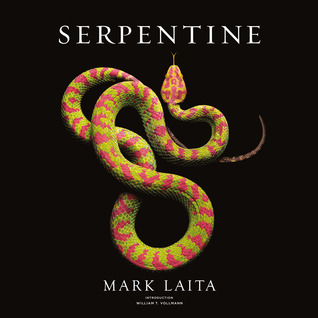 Photographer Mark Laita unveils a pantheon of spectacular snakes in this electrifying collection. Inciting both allure and alarm, shining pastel pythons and vibrant green vipers slither across the pages. An illuminating essay by William T. Vollmann accompanies the images, delving into the associations with snakes that haunt our collective imagination. From the iridescent blue Malaysian coral snake to the candy-cane-striped albino Honduran milk snake, the aptly named beautiful pit viper, and the gleaming black mamba, the world’s most dangerous and gorgeous snakes are pictured in Serpentine, showing off their fascinating colors and textures—as well as the sensual forms their movement creates. Through Laita’s lens, there is nothing they can do, no position they can take, that fails to be anything but mesmerizing. I’ve been fascinated by all things reptilian since childhood, and that interest persists today. It’s just an interest, not an obsession, so there’s no need to worry about me filling my apartment with monitor lizards and turning the thermostat to 80 just so they can be comfortable like Ron Huff did. By the time I reached the sixth grade, I amassed a little collection of books about reptiles and memorized their contents, so I felt pretty confident that I could identify any I came in contact with. During show and tell, when my teacher was looking for volunteers to get up close and personal with a boa constrictor, my hand shot up. Even though I knew that snakes are not slimy, its warmth and smooth texture still surprised me. I liked the feel of its strength and solidity while it was draped around my neck and wondered why people would fear such magnificent creatures. Since then, I’ve seen lots of reptiles at zoos, and a furious rattler at Mt. Diablo National Park that was blocking traffic, but didn’t have the opportunity to handle a snake again until I attended a reptile show at PetSmart. Once again, my hand shot up when the handler was looking for volunteers. It turned out I was the only one with a boa constrictor around my neck while all these little kids were watching. Too bad they were missing out on all the fun. My husband was clear across the store playing with a Rottweiler pup named Bruiser and wanted nothing to do with me while I was wearing the boa necklace. This book is all kinds of awesome! The plain black background enhances the color, texture, beauty, and graceful motion of a wide variety of snakes. There is a nice introduction by William T. Vollmann and a glossary featuring each breed’s vital stats. It looks great on my coffee table and I’m sad about having to lug this great big book back to the library.